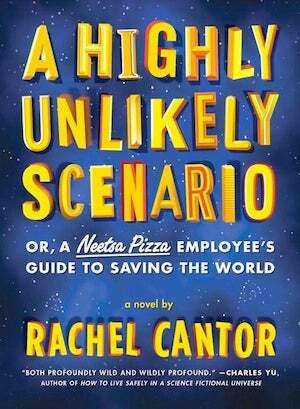 A Highly Unlikely Scenario, by Rachel Cantor, takes place in a world where computer programs walk among us, the police wear Chipmunk Patrol sashes, and quasi-religious philosophical groups battle for converts via fast food restaurants. This dystopia comes replete with a Leader whose food preferences are kept secret to preserve unity, though a neo-Maoist book group claims the Leader has seized control of the Menus. From that description, readers may think they know what kind of book they're reading, but long before they can get their bearings Cantor is spinning out a plot about medieval Jewish sages, the Voynich manuscript and an elementary schooler who does awesome karate kicks. Leonard is a Listener, as determined by his Neetsa Pizza Pythagorean Mentor, meaning he spends his nights answering the irate phone calls of clients-in-pain and offering them compassion via coupons. He also babysits his nephew Felix, of the awesome karate kicks, every day after school while Felix's mom Carol works at Jack-o-Bites, a Jacobite eatery or hangs out with her neo-Maoist book club. Leonard's life is uneventfully small as he toils in his home office until he gets a phone call on the complaint line from Marco Polo. Leonard, who is not terribly worldly, has no idea who his caller is, but with the guidance of a medieval Kabalist, who sounds like Leonard's dead grandfather, Leonard finds himself sucked into a world of metaphysical time travel, Latter Day Baconians and Tibetans (who, the very mention of, can short out phones and computers). Leonard bumbles his way through with little more than his belief in Pythagorean principles and his ability to listen. He also gains an ally in a beautiful woman with prophetic powers and no need to wear freckle dot makeup. Cantor's first novel never takes an obvious turn when a stranger one might do and the result is a plot that bounces, soap-bubble like, above a world that is equal parts absurdity and whimsy. The book is packed with strange details and odd moments. Cantor has a firm grasp on building a familiar yet surprising world with language – cubits and lucre their more common synonyms. Combined with the Leonard's "young man goes out into the world to seek his fortune" story, the whole thing has the air of a fable translated from a very foreign language. 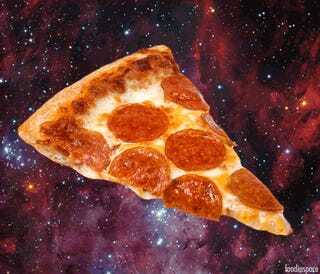 A Highly Unlikely Scenario or, A Neetsa Pizza Employee's Guide to Saving the World is neither a heavy or dark book, even when the future hangs in the balance. But its anti-grittiness, its sheer sense of wonder and fun make it even more unlikely. Sometimes, all anybody needs is a good listener.